Priced at a hair under $250, the V-Moda Crossfade M-100s represent one of the best pairs of headphones that we have reviewed at NeuFutur. The rugged build quality of the headphones ensure that they will be able to be toted around and put through the normal rigors of everyday life without seeming the worse for wear. This is due to the considerable amount of metal (rather than plastic) that are used in the creation of the headset; The fidelity of the playback of the M-100s ensures that listeners will be greeted with lows, highs, treble, and enough bass to make any music shine brilliantly. The quality of the audio is leaps and bounds above other products as a meeting of the audiophile minds have ensured that purchasers will be given the truest recreation of whatever music or voices that are present. The seal that is created by the Crossfade M-100s is substantially greater than other offerings, ensuring that purchasers are placed into a bubble free from interruptions. A consequence of the memory foam earcups means that those around will be unable to hear the music/vocals being played through the M-100 headset. Where the M-100s truly shine is that one can replace those parts that garner the most wear. The memory foam cushions can be purchased directly from the company, while V-Moda offers purchasers the opportunity (for a small fee) to have a variety of logos engraved on the side panels. The M-100 headset is the first one we have reviewed that has a sturdy case included. Where other headphones have a cloth carrying bag as standard, the exoskeleton case protects against the elements and gravity. The included carabiner makes mountain the headphones/case to a bag or a knapsack easy and secure. The final strength of the M-100 headphones comes in the wide variety of detachable cables that are included with purchase. 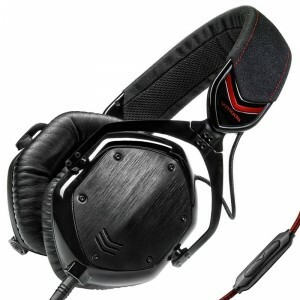 The dual inputs make it easy for individuals to listen to music and commands in-game, while the mic cable will transfer crystal-clear vocals to a headphone/cellular device. The M-100s will work with a wide array of smartphones, tablets, and other electronic devices with a simple plug-in. The headset is a little heavier than similar products on the market clocking in at a shade under 10 ounces, but the balancing of the headset allows for the weight to be distributed equally. The headband materials can be flexed to a considerable degree multiple times without losing shape. The Crossfade M-100 headset is available from a wide variety of online and brick and mortar retailers starting at $250. For more information about the entirety of the V-Moda product line, visit their domain or social networking accounts. Few headphones are able to be dropped tens of times from six feet and sound so good after each bump, jostle, and ding.